There are countless benefits that come with owning beachfront homes, from stunning vistas to liberal ocean access. Americans across the country dream of owning property on the beach—of spending their days splashing in the warm ocean and their evenings watching the sunset over the water. But beachfront homes do come with their share of challenges. Coastal homes are frequently exposed to harsh elements like moisture-fraught air, bright sunlight, strong winds, and saltwater corrosion. To build a sturdy home that can withstand Mother Nature’s temper, you must use proper building materials and techniques. Below, we’ve listed a piece-by-piece guide to building a beachfront home that will remain strong and attractive for decades to come. Framing. When choosing a framing material for your home, you have to take the threat of salt water corrosion into account. Salt can cause serious damage to certain materials, so it’s essential to use corrosion-resistant materials when building your house, such as concrete and treated wood. You must know where to use treated and non-treated materials. For example, wolmanized PSL’s will far outlast pressure-treated girders on porches where exposed to the elements. Exposed rafter tails should be pressure treated and pre-primed on all faces. 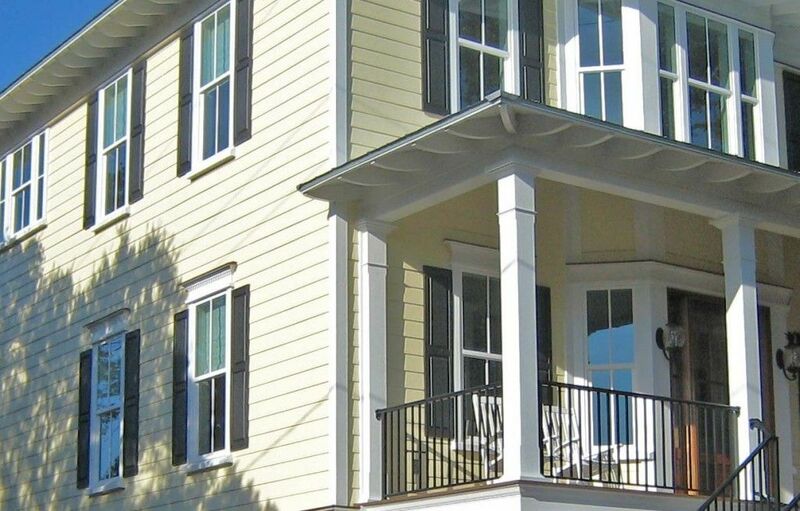 Sea Island Builders uses hot-dipped galvanized nails in our framing applications as well as stainless steel strapping and throughbolts where exposed to outside air. Hardi siding on a beachfront home in Wild Dunes, SC. Siding. We at Sea Island Builders recommend using brick, Hardie-plank siding, or a composite material similar to Azek, for most exterior applications. These are some of the most durable materials available for siding construction. However, brick will typically last longer than Hardiplank, surviving the salty wind, rain, and sun for over a century before it begins to show sign of serious wear. Brick also provides more efficient thermal and sound insulation. Though brick is the more expensive choice, it will cut down on maintenance costs for your beachfront home and increase its resale value. Sea Island Builders supplies its clients with alternatives depending on the look and feel you are looking for; we will not use any materials that will not hold up to the long-term effects of the salt air. Roofing. When compared to asphalt shingles, metal roofing is much sturdier and better able to resist rot, mildew, wind, and termites. Because metal roofs reflect the sun, they may also be able to lower the cost of cooling your house by up to 30%. While you may pay more upfront for metal roofing, in the long term, this type of material will end up saving you money in maintenance and cooling costs. There are many types of metal roofs, and again, depending upon the look a client wants, Sea Island Builders will advise of all the pros and cons of different roofing options as well as their overall impact on budget. Impact rated windows may cost more, but they combine style and safety. Windows and glass doors. To protect beachfront homes from the threat of hurricanes and storms, it’s well worth it to invest in impact-rated glass for your windows and doors. In fact, the 2012 IFC Code, which took effect in January 2014, required that all openings either use impact-rated glass, have impact-rated shutters over them, or have impact-rated panels precut with hardware pre-installed prior to a certificate of occupancy being issued. Impact-rated windows are specially designed to hold up under pressure, providing security from flying debris as well as keeping your home watertight. This is particularly important if your windows and doors face the sea. Impact-rated windows are almost always the golden standard once clients are fully advised and made aware of which each option entails. A great option for beachfront homes is Azek Decking on an entry porch. Decking. There are so many options when it comes to decking. We always push clients to take a green and renewable approach when possible. Clients do love and demand the use of Ipe in many applications, which is an exotic hardwood. Suitable alternatives to Ipe include Garapa, which is substantially less expensive but just as durable. Composite, PVC, Capstock, and ASA wood are also great options because they require little maintenance and stand up well to the elements. Azek is becoming more commonplace as exotic materials, such as Ipe, have become scarcer and more expensive. Azek comes in a variety of colors and board widths. Insulation. Coastal areas typically have quite a bit of humidity and moisture in the air, which can cause the wood to warp. In order to protect hardwood floors and seal out the moisture, coastal homes should always have closed cell insulation underneath the first floor. Closed cell insulation is a spray foam alternative to fiberglass, with a dense constitution that acts as an ideal barrier against air and water vapor. For maximum insulation, Sea Island Builders recommends using closed cell for the attic, floors, and walls to create a protective envelope around the interior of your beach home. There are other options, such as spray in Spider Batt insulation, which is suitable for application in exterior walls. Paint. There have been vast advances in paint technology in recent years. Depending on the material being painted, Sea Island Builders will discuss all the options available for a beachfront home. All of the wood Sea Island Builders installs on the exterior of houses gets primed on all sides, even the cut ends of boards. This ensures that as much water as possible is kept out of the wood. Interior and exterior paint products differ greatly. We encourage the use of low VOC products and have found some great ones to recommend. 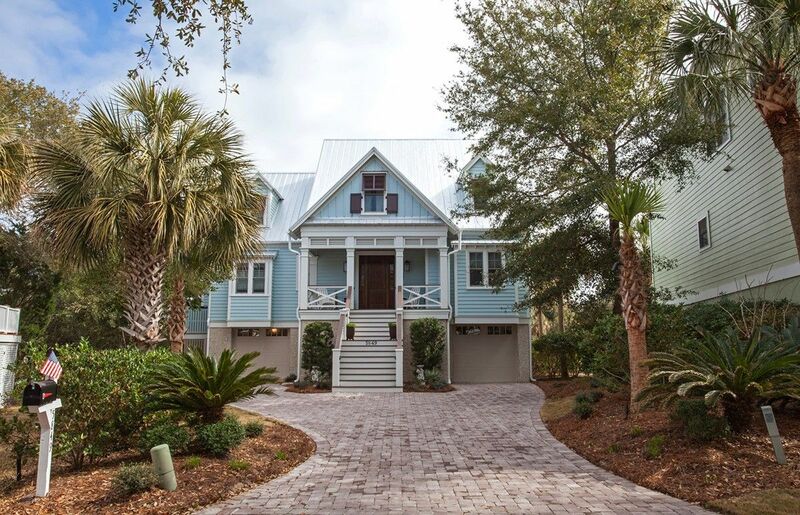 Sea Island Builders has been building beautiful and long-lasting beachfront homes around Charleston for over a decade. If you are thinking of building or renovating your coastal property, give us a call at 843-883-7430 to get started.